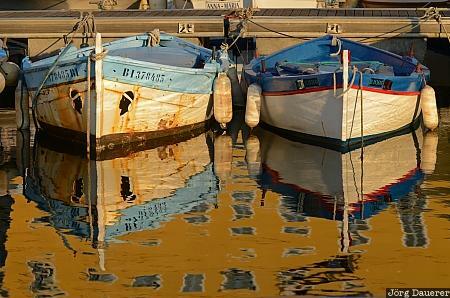 Two small boats and their reflexion in the calm water of the old harbor (Vieux Port) in the center of Bastia illuminated by warm morning light. Bastia is in the south of Cap Corse in the north of the mediterranean island Corsica, France. This photo was taken in the morning of a sunny day in September of 2011. This photo was the image of the month in November of 2012. This photo was taken with a digital camera.